William Davis : Surf-Board Riding, Kealakeakua Bay, 1836. 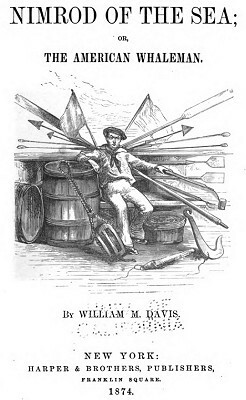 Nimrod of the Sea; or, The American Whaleman. Harper & Brothers, New York,1874. Davis, William M. (William Morris), 1815-1891. William Davis served on the whaler Chelsea; departing New London in November 1834, she returned with a catch of 1800 sperm whales. The crew made two landfalls in the Hawaiian Islands, the first at Honolulu in January 1836. In March 1836, the Chelsea anchored in Kealakeakua Bay, famously depicted in John Webber's:A View of KaraKakooa, in Owyhee, 1778, and James Cook's last port-of-call. Davis had high praise for the Hawaiians' peaceful disposition, also wonderfully manifest in the ten Kanakas of our crew. In a detailed report, he was very impressed by their diving skills and judged that all over fifteen months were able to swim. Most significantly, at a point of rocks on which a magnificent surf was breaking, Davis found a large number of the natives enjoying themselves on the surf-board; riding, with head inclined, on the crest of a foaming wave, with the speed of a bird. Here they would mount the board again, to career once more over the frightful course; and thus they played by the hour, far happier than beaux and belles in the ballroom. The wilder the surf, the more intense their enjoyment of it. It was placed length-wise under the breast as they rode on the crest of the wave. It was not until the afternoon of the 23d that we dropped anchor in Kealakeakua Bay, the scene of Cook's death. After furling sail, and getting the decks cleared of rigging, the trading Kanakas were allowed to come on board, with fruits, shells, tapa cloth, etc., which were offered in exchange for articles of iron. Starboard watch had liberty on shore. We were particularly charmed by a large company of small children, who were playing, naked as when born, on a shelving beach of sand, on which the gentle swell was breaking in miniature surf. The little brown beauties were from six months to six years of age. All were fearlessly playing in the water, at depths proportioned to their years; dabbling as naturally as young ducks, the elder having a watchful eye on the younger ones. With great glee this guardian would roll a sprawling, choking youngster upon the sand, and by patting his shining back, enable him to cough and sneeze out the effect of a momentary submergence. ion of their elder playmates. A very noticeable feature in the merry group, was the absence of all loud, discordant cries, angry exclamations, and evidences of a quarrelsome disposition. I am told that such is very rare; and it rarely happens that the hand of one is raised in anger against an- other. The same peaceful disposition was wonderfully manifest in the ten Kanakas of our crew. In the three months they have been on board, there has certainly not been a quarrel among them; nor can I recall a harsh word between the poor heathen. But of us white and black Christians the same can not be said. The happy mothers of our little savages were swimming in the deep water of the bay, and diving for shell-fish, each having a long gourd anchored in her vicinity,-into which she might drop such shells as she secured. We laid ourselves upon the lava ledges which overhung the beautiful scene, and the swimmers observing us, they with great shouting and splashing attracted our attention. A friendly competition then arose, in the exhibition of their skill as divers. A black-haired, black-eyed mermaid, more beautiful than the syrens of old, I'll be sworn, stood erect in the bright water, and clapping a pair of pretty hands gracefully over her head, with musical cries strove to secure our special attention. Then, turning and undulating as a wave, her twinkling feet for a moment shot in the air, and the vision disappeared long enough to cause us to hold our breath in sympathy. Arising at length, the pretty head, with long black locks all afloat, was again turned in our direction to see that we recognized her; and with clapping hands we cheered her and the other competitors. When rested, we were attracted by the shouts of natives, and we sauntered to a point of rocks on which a magnificent surf was breaking. Here we witnessed an exhibition of skill in swimming, in striking contrast with that of the women we had just left, and one perhaps to be witnessed nowhere else. Here we found a large number of the natives enjoying themselves on the surf-board. It was a new sight to us to see men and women playing in a surf such as we would scarcely expect the natives of the water to live in, such as it is questionable whether the seal and the otter could have contended against; and it was with some terror that we watched them riding, with head inclined, on the crest of a foaming wave, with the speed of a bird. incoming roller, and diving to allow it to pass over them, bearing on its crests some of their playmates, and soon again they regained the outside of the breakers, pushing their board with them. The surf-board seemed about five feet long, and a foot wide, turned up a little in front. It was placed length-wise under the breast as they rode on the crest of the wave. Geoff Cater (2017) : William Davis : Surf-Board Riding, Kealakeakua Bay, 1836.